I am writing this from Horse Racing Nation World Headquarters in Shreveport, Louisiana! Wait, you thought that would be in Louisville or Lexington? Seems like it should be, but that’s right – the home of the most innovative new horse racing fan site is in Shreveport. And I’m not just saying that because I work there. If you haven’t checked it out already, why not? HRN is set up to be the Wikipedia of horse racing. But unlike the Big Wiki itself, HRN vows to capture info for EVERY horse, from stakes winners to claimers. 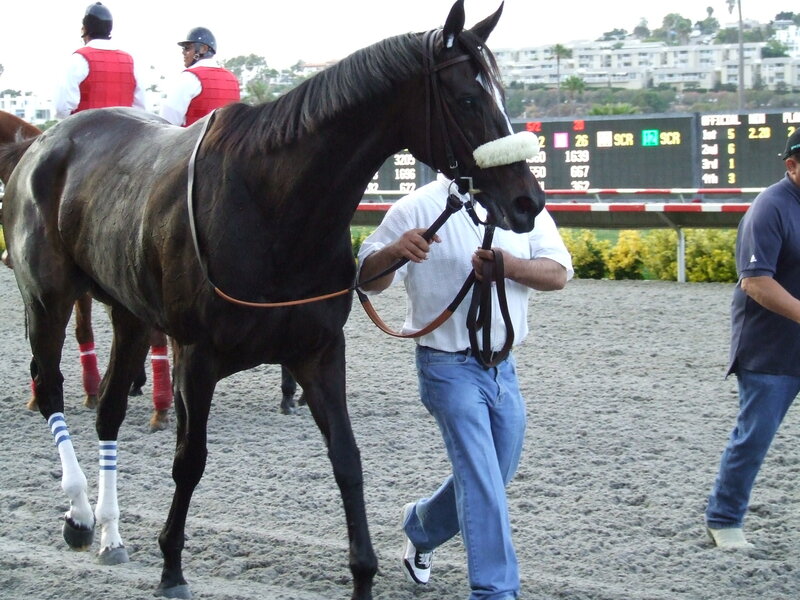 You will find info on Zenyatta at Wikipedia, but try looking up Great Bernardine. She’s on HRN. Anyone can add a horse or update the data. It is far from complete, however, especially regarding the historical horses. I recently did some data entry for the legendary runners Ack Ack and Affectionately, two champions of the past. But they are not the only ones who need help. Aside from the wiki, there is also a raucous community discussion ongoing. Lately it has focused on a retread of Zenyatta’s place in racing history, but there has also been lively talk about US vs Euro runners. It should get even more interesting as more people join and the Breeders’ Cup gets closer. Part of that discussion includes a daily ranking of each horse. On Mondays, the ratings are frozen and a new Power Ranking is generated using a complicated algorithm that I can’t explain (but it’s pretty nifty). So what do I do for HRN? I write the Weekly Power Ranking Report! Yeah! I get to peek at the snapshot before anyone else & do a report about the latest movers-up and droppers-down. I also monitor our Greatest of All-Time ranking and comment on the way the community views Man O’ War vs Secretariat. Who are the Top 250 Fillies & Mares of All Time? Rate Them On HRN! I also get to do some marketing for the site as well – I make email blasts! There is an art to those little emails that you get each week, so do us all a favor and click on them before you trash them, please? I try to put in stuff I would want to read, and there aren’t too many ads. I am also learning the secrets to web site success. There is a system that puts the sites you see first on Google, and HRN has mastered it. 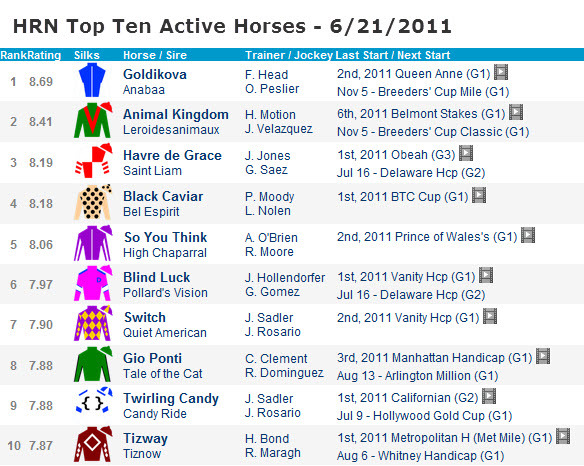 Go ahead, search “2011 Travers Stakes” and see how high HRN ranks. That is not by accident, but by a process that began with the construction of the site’s foundation. It continues in small, almost imperceptible ways throughout the wiki and in the blogs, news and links. Even this blog helps HRN secure its standing among the millions on Google. HRN World Headquarters shares a building with an up-and-coming software and web development firm called Twin Engine Labs. The geeks next door developed an iPad app that was featured in an iPad TV commercial, and they were stoked with excitement. They found that they could do even more business if they were higher ranked on Google. Who did they go to for help in strengthening their Google search results? They asked Horse Racing Nation. A horse racing company. I don’t need to tell you that horse racing is not known for innovation, and you never hear about other, successful industries coming to racing for advice. But I nearly fell out of my chair when the software developer came over to talk successful strategy with A HORSE RACING COMPANY! Yes, on that day, Hell’s temperature dropped a few degrees. And that is just one thing that HRN is doing to up its cred and help horse racing live up to its historic awesomeness. I can’t tell you anything more right now, but if you thought Keeneland’s Facebook app was cool, just wait for what we have coming up this summer! OMG I ttttremble with excitement! But I will tell you about that when the launch date gets closer. Shreveport is across the river from Bossier City, home of Louisiana Downs. I’ve been to the races there a few times and even got to watch from the announcer’s booth on Belmont Day. It’s a pretty nice racino, with updated facilities and what is said to be a tasty buffet. I’ll have more on that later, too. I saw Secretariat tonight at a sneak preview screening with the rest of the RTIP. I enjoyed the movie, despite its fuzzy history and melodramatic tendencies. It is a nice tribute to Big Red. People who were old enough to remember 1973 will see it as a fun look back in time, and the young’uns will enjoy the racing scenes. Jim would have loved it (NOT ENOUGH GAFFNEY!!). I found myself reciting the race calls of the Triple Crown races. I only tear up over horse races. By the time they got to Belmont I was on the verge of a meltdown – but not because of “Penny’s heartwarming family scene.” I was picturing the magnificent performance that I’ve seen thousands of times on video. Secretariat is one of those personalities difficult to make non-documentary movies about because of the intensity of his fans. We know all the stats, have seen all the races and can quote the calls, we’ve seen all the interviews and heard all the stories from the major players. He was such a striking physical specimen that it’s hard to cast stand-ins. But the most difficult thing for a feature film to capture is the personality, the style, the raw emotion stirred by the original Big Red. I would have been just as happy had they simply showed the original Triple Crown races on the widescreen, and wrap myself in nostalgia for a time and a hero I never knew. Trolley Boy at the 2008 Bourbon County Secretariat Fest - today he's the star of Disney's Secretariat movie! While the film is scheduled for wide release October 8, the lovely folks at HRTV provided the RTIP with advance screening passes! My sneak peek at this long-awaited movie will be Sept. 16, ten days away! I can barely contain my excitement, though there is a twinge of sadness as well. My old friend Jim Gaffney will be there in spirit. Today I ran across this article about the horses who play Big Red in the movie. 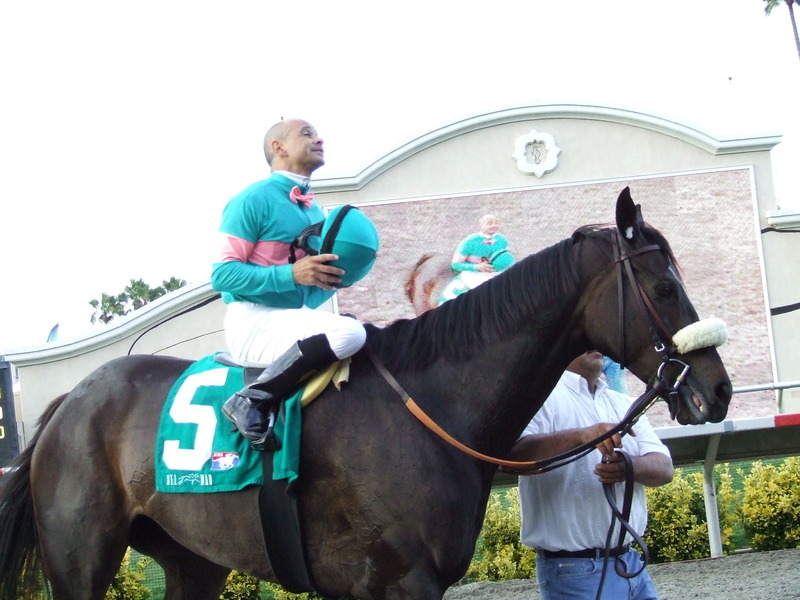 For those who are new to The Infield (or have forgotten), the main actor horse was selected at the First Bourbon County Secretariat Fest in 2008. That’s Trolley Boy, mentioned in the article. Also, the horse pictured with the article may be Trolley Boy – he has a similar face shape to the one in the photo. Check out the full story here, and the photos are in this album here! HRTV is also sponsoring a drawing for a trip to the Hollywood Premier of the movie, so go here & register. It’s free! 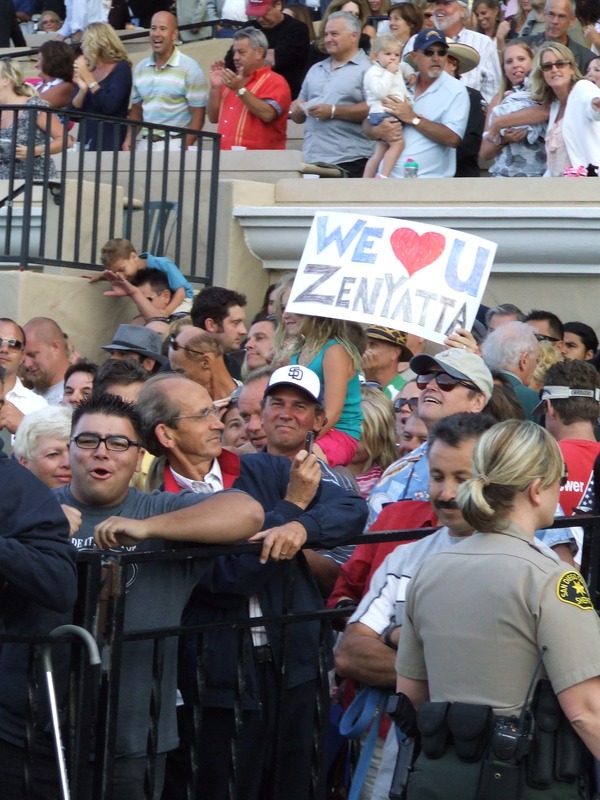 The most asked question on all of the Del Mar social media sites since July 6 was: Is Zenyatta going to race there? Many close followers of racing (and those who think they know everything) probably believe that the track was confident in her entry, knew it all along, so much so in fact, that they made souvenir pint glasses to give away on Hirsch day. 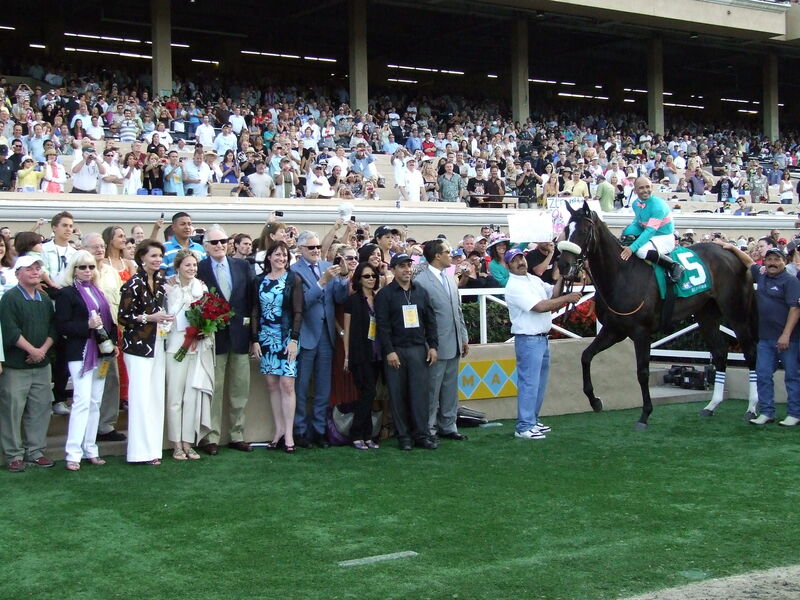 Fact is, the people in the Del Mar Executive Offices were as anxious as the fans about her entry in the Clement Hirsch. The uncertainty hovered even up to race day. When I arrived that morning, the buzz was that another trainer had pulled his horses from training over the polytrack and that Z’s connections were going to scratch. Then the rumor was that they were going to wait until the 2nd race to decide whether to scratch. Then the time pushed back to 45mins before post time. You can imagine the hairpulling that went on behind the scenes. (Don’t quote me on this, but I am pretty sure the pint glasses were a year in the making, due to the production/shipment schedules from China and all). So it was a huge relief when the big, near-black mare with the tornado-shaped blaze finally approached the receiving barn, entourage close behind, camera crews and photographers in pursuit, around 5:45 p.m. I had scouted a spot just outside of the barn, at the shoe inspector’s truck, for my pre-race glimpse. All of my backside excursions, all of the people I’d met and shadowed throughout the past 4 weeks had well prepared me for this assignment. I knew that it would be difficult to get around the Sherriffs barn on race day (both due to the queen’s schedule as well as my internship duties). The paddock was out of the question, too – there were over 400 paddock passes given out for the media & connections of the horses in the Hirsch. Even if I’d gotten in, my pics would have been over heads and between arms. But I knew every horse had to stop by the receiving barn for I.D. and shoe inspections. She was poised and calm at that point, not yet ready to start her famous strut. The afternoon sun shone brightly, illuminating the dapples on her gleaming coat. She was a pro at shoe inspection time, lifting each hoof delicately before farrier Victor even reached for them. Zenyatta stood calmly as horse I.D. expert Diane flipped the mare’s upper lip to check the tattoo. That’s when I had to dash. The next step in my Hirsch game plan was the most difficult. I hurried through the mob at the paddock, squeezing between and ducking around people who craned their heads to see even an eartip of the fabulous Z. My destination: winner’s circle. I staked out my spot along the rail as the 8th race went off. A few other photogs and a video guy or two also had the same idea. I looked back at the grandstand – every level was packed. The apron was 10-deep, even for the 8th race! I spotted a few pink and teal signs among the mob. The crowd around me at the rail grew with each minute as well, until security had to hold back at least 200. There was an enormous cheer as the gates opened and the mares leaped out. I almost couldn’t hear announcer Trevor Denman! As the field raced past us for the first time, Z was in her usual spot at the back. Behind me, a gentleman was excitedly hollering, “that’s it, slooow it down Raphey, slow it down!” This was Rinterval’s trainer, Eric Reed. He continued shouting as the horses galloped around the turn and into the backstretch. I looked back at the stands again: the jubilant faces, the fists pumping, the cryers, the laughers, the little girls and the older men, all in love with a horse! Walker (my boss) motioned for me to slip under the rail and join the rest of the press corps on the track. 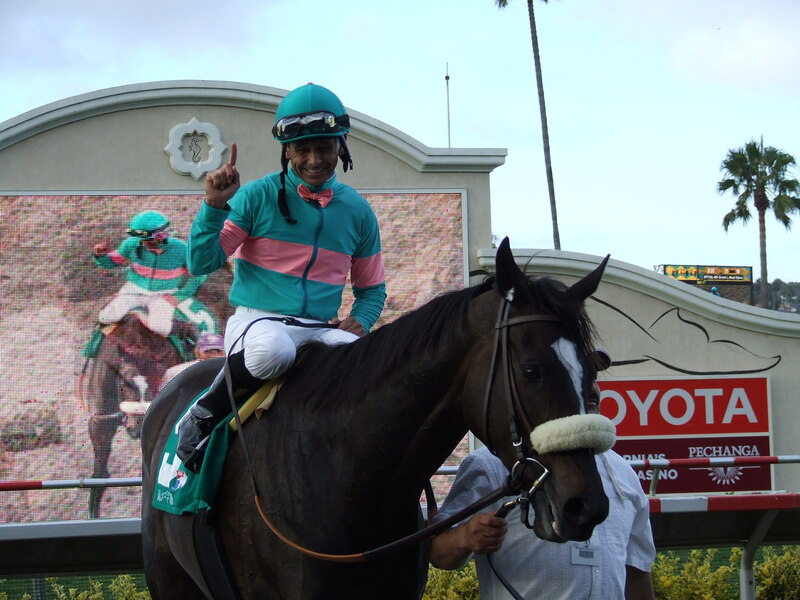 She made a valiant victory pass, Mike Smith beaming his dimpled smile. I was in awe of being so close! She was barely breathing hard and there wasn’t a drop of sweat on her! I managed to get between the press hounds and snap off a few wonderful shots as Zenyatta entered the winner’s circle for the 18th time in a row, and her 3rd time in the Hirsch. It was a spectacular day and one that I will remember fondly for years to come. 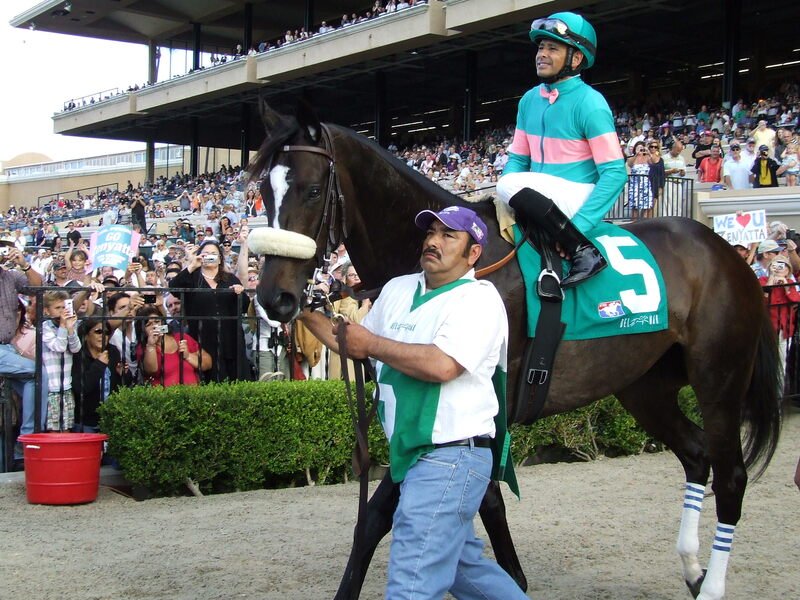 If you ever get the chance to see Zenyatta in person, take it – you ain’t seen nothin’ like it! As the crowds lined up outside the gates, I spent my time resetting my camera. The day before, my photoshoot of the Queen during her morning routine went well, but when I uploaded the photos, most of them were blurry, unfocused messes! I was so disappointed! I was determined to figure it out before the 9th race, and after a bit of fiddling I discovered the problem. I also had 2 specific undercard races to practice. The crowd clamoring for Zenyatta and her pint glasses was so large the track opened early to alleviate the craziness. I got pulled from photos to help man a distribution booth in the clubhouse. The only thing that went faster than the pint glasses were the plastic bags we handed out to help carry them! I got a quick lunch break and then grabbed my camera for a trip to the paddock for the 3rd race. Tom Blincoe’s Tall Texan was in, as well as Carla Gaines’s Doppio and Henry Moreno’s Party Mandate. I have become great friends with Texan, who likes to eat butterscotch and root beer flavored hard candy. Gaines is a fabulous trainer & nice, too, while Henry is probably the most flirtatious trainer there (but it’s all in good fun). The Whitney at Saratoga went off while I was in the paddock for Tall Texan. I watched the race on the big screen with Willie, the main paddock guard. We were both rooting for Blame, and gave high-5s when he won! As the horses exited the paddock for the race, a blonde lady in a blue blouse & sunglasses hurriedly asked me who won the Whitney. I cheered, “Blame!” and then realized the woman was Bo Derek. Great Bernardine raced for my RTIP classmates in the 5th race. I was paddock-side for that one, too, and met trainer Mag Perez & his lovely wife, Candace, as well as P Val. I got a pic with P Val, too, just before he got a leg up on Bernardine! I was thisclose to Ken Rudolph during the Hirsch. Zenyatta gives me the eye at Del Mar this morning. Jerry Moss & Dottie Sheriffs in background. Today I started at Sheriffs’s barn around 8am. 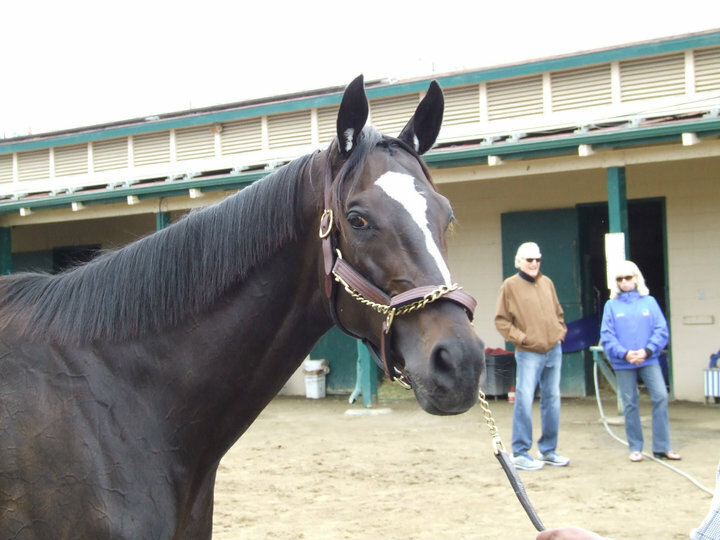 Zenyatta was tucked in her stall, gazing out at the other horses coming in and out of the stable area. John told me to come back around 9, when she would be making her appearance on-track. I meandered over to Baffert’s barn next door, where the place was bustling with activity with nary a media person in sight. A big chestnut horse was having his post-workout bath and I recognized him as Misremembered. I asked his groom if I was right, and he said yes. I snapped about 8-10 pics of him enjoying the sudsy water. The groom then pointed out that Bob had gotten a parking ticket! The black Range Rover was parked in front of his office, a tiny pink slip stuck under the windshield wiper! I took a pic of that, too. The Man himself was over at the gilley stand watching horses work and didn’t know he’d been cited*. I then headed down to see The Pamplemousse again. I passed Julio Canani on the way and he said, “your horse just galloped!” I said, “You know where I’ve been this morning!” And he gave a sort of exasperated “humph” as he continued on toward the Racing Office. The Pamplemousse was walking around the ring in between barns, as cool and collected as ever. He really is an athletic colt and deserves to return to the level of competition he left last year. I hope he can do it. I hurried back toward the Z Epicenter, just in time. There was a crowd of TV cameras, news photogs and random backstretch visitors gathered to see her. Also, everyone in the office decided to call me at that moment to get the scoop on her activities. I felt kinda dumb talking on the phone while everybody else was awe-ing. When she appeared from her stall, she was magnificent. All 17-hands of muscle and bone and dark bay coat towered over her groom. Cameras snapped and videographers jockeyed (hah!) for the best spot to capture her. 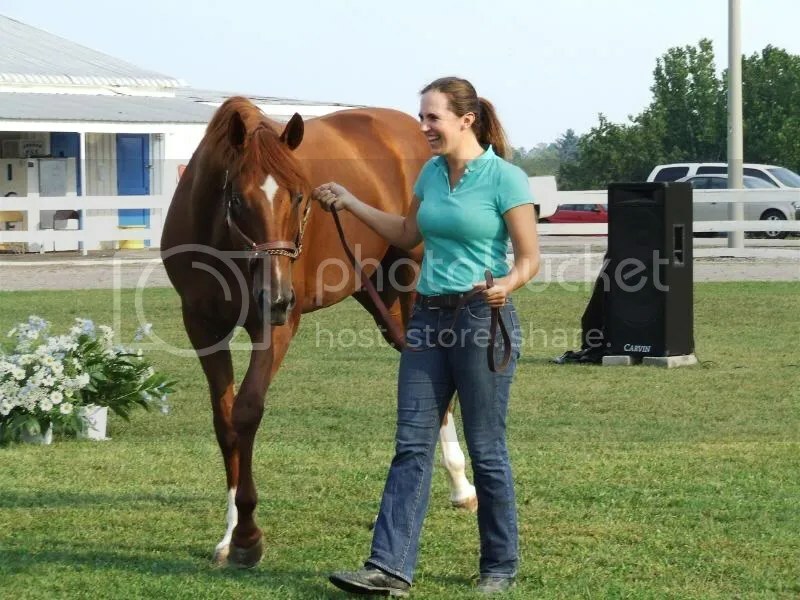 She went around the walking ring a couple of times with her exercise rider, Steve, and then headed for the track. I stayed close on her heels as she power-walked to the gap but soon fell behind, she is a *very* fast walker! She moved effortlessly over the polytrack during the gallop. The rest of the horses and riders had cleared the track, just for her. Sheriffs watched through binoculars with a big grin on his face. The gilley stands were full of onlookers. The entire executive office was a ghost town as everyone rushed down to the apron to watch her pass by. After one lap around, Zenyatta was hardly winded and had barely broken a sweat. That was enough for the day, however, and she exited the track to the applause of the fans. I met her back at her barn, along with the rest of the press corps. There, she walked the ring several laps, stopping each time to pose for us. Her legs were hosed and washed, and then she was allowed to graze on the sod panels carfully laid in the center of the walking ring. 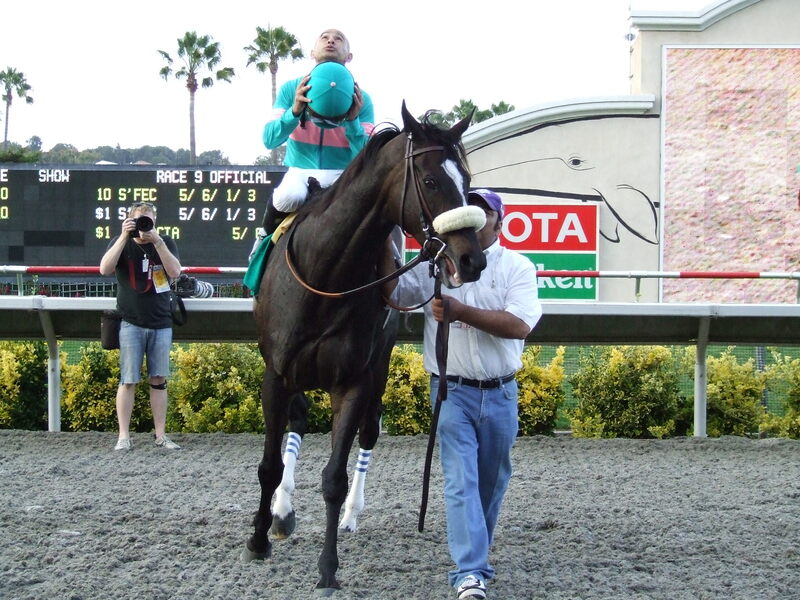 *Baffert returned to his barn just as Zenyatta was getting ready to go out to the track. By that time as well, Jerry Moss had arrived in his town car, which was parked directly behind Baffert’s. Baffert spotted the pink ticket and quipped, “Where’s his ticket?” pointing to Moss’s car. Then he took the slip off of his window and pretended to put it on Moss’s car. Moss chuckled. It was all in good fun, but I think most of the eyes were on Z and probably missed that exchange. Baffert seems to be a big fan of Z, as he hung out watching her just like all the rest of us fangirls and horse geeks. I managed to sneak into one of the photos today, too. I really was there! I have had to work on my birthday every year since 2004. It is a hazard of having your birthday 2 days after a national holiday and usually one of the busiest days for major tourist attractions. This year I was off for the 4th, but by some strange coincidence I ended up driving into work today, my 28th birthday! 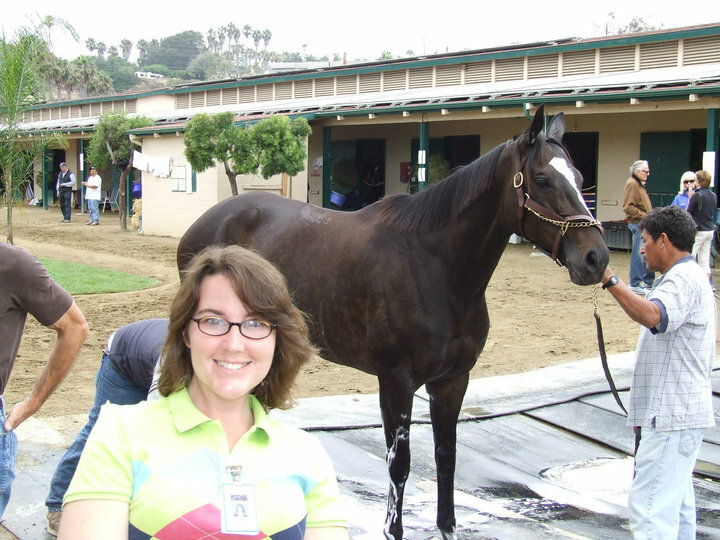 But this was not the usual grind, it was my first day as an intern at Del Mar! First, I totally underestimated the morning rush hour traffic. The same route that took 20 mins last weekend took nearly an hour to traverse today! It was also really messy/dreary/drizzly this morning, too. What happened to California sun? But I made it just in time! The track was still overrun with midway rides and food carts from the county fair. I made my way through to the executive offices to start my Del Mar adventure. I totally geeked out over all the magnificent paintings in the hallways, of such stars as Lava Man, General Challenge and Skimming. Best Pal’s portrait is in one office, Candy Ride’s in another. It was an impressive collection of sporting art that this blogger totally envies. The other interns are from a variety of places and have different interests: Amy, who worked last year, is our leader; Andrew from Pasadena just graduated from college; Meganne spent 4 years in Italy and came from Louisville. I can’t wait to get to know them better. I met so many people today that I don’t remember everyone’s names. I also got to creep around the grandstand and sneak up to the press box. I will get to the barns and backstretch before the end of the week, but today was just too messy to do anything outside. I got my credentials and parking pass (so glad I dressed up today) and started in with some filing and labeling work. Tomorrow is envelope stuffing. Who knew that all those years of Sir Speedy collating would still be useful today? Here’s a head’s up though: Del Mar media guides are hitting the post office this week. Along with the gorgeous photos of Zenyatta, there is a half-page list of Summer Interns on page 58. Check out the *only* one from Tennessee. I didn’t even bother to take pics today since the weather was sooo nasty. You’ll see pics here at the first hint of sunshine. Being the glutton for punishment I am, I’ve gone back to school. But there is so much more to it than that. In August, I quit my job (the one I had loved for 5 years!) and picked up and moved 1500 miles away to Tucson, Arizona, to attend The University of Arizona’s Race Track Industry Program (RTIP). I’m moving up in the world. Every single day, I learn something new and interesting about racing — stuff I never even thought about before in the areas of regulation and track management. I’ve learned more about quarter horse racing, too, and harness racing. Greyhounds are still fuzzy. My professors are awesome. They come from the industry, have seen the way things work first-hand, have dealt with the problems and lived to tell about them. They’re always sharing their stories with students, and I’ve heard some doozies in the past few months. The guest speakers this semester have been amazing, too: Rob Terry, of RGS, Inc.; Roxy Roxborough, the legendary linesmaker from Vegas and Lou Raffetto, CEO of the National Steeplechase Association. I’ve met the man in charge of bringing foreign horses to the BC, Nick Clarke, who did a great presentation on international racing. Every day, every class, is like a dream. I have exams about horses! I also work for the program. I’ve been updating the RTIP Facebook & Twitter pages, as well as writing and editing press releases and working on the program’s newsletter, the Update. I’m trying to learn everyone’s name and have made some great friends already. The students come from all over the country, and have as varied experiences in the industry as one could imagine. There are total civillians like me, who came into the sport as fans and horse lovers, and then there are students who grew up on the farms I’ve toured and who have been around racing, hands-on, all their lives. 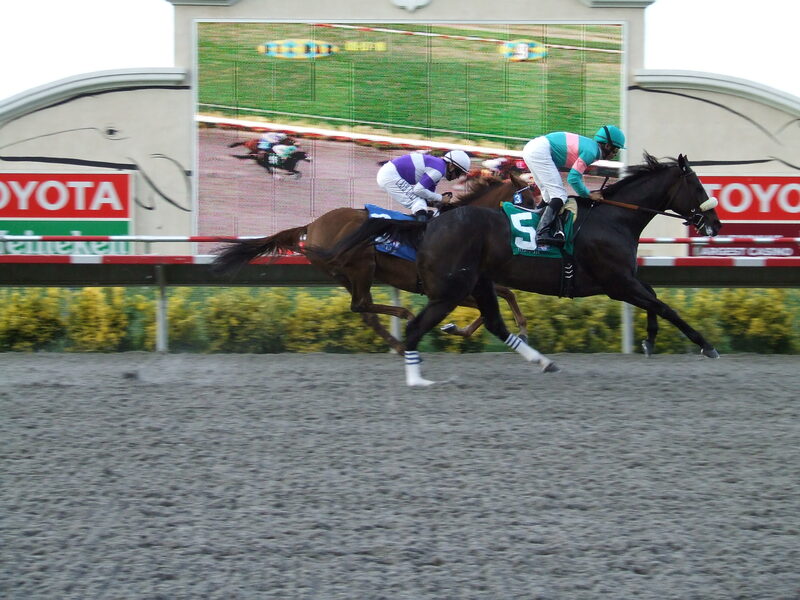 The main event for the fall is the Symposium on Racing and Gaming, which will be Dec. 7-10. The list of attendees grows by day, and it is shaping up to be a great event. There will be many panels on marketing and promotion of racing. That is where I hope to find my place. I think racing is the greatest sport on the planet and have some ideas to help convince others that I’m right. After all, if they can keep Elvis popular for 32 years after his death, then surely a sport that renews itself each spring can grab some attention. So that is what I’ve been up to since June. I’m moving up, from the Infield, where it’s been fun, to the Boardroom, where it’ll be real.